Ginger Cupcakes based on the recipe from the Hummingbird Bakery book. The amount of ginger to use is a bit confusing as they say to use 200g and then reserve the syrup, so I think you are meant to weigh the ginger with the syrup, and then chop the ginger that is included. I say this in retrospect, as I decided to weigh 400g of the ginger itself (I was making double the mixture), and when chopping the it, I found the process extremely tedious. Plus it looked like there was a lot of ginger. I ended up only chopping around 300g of the ginger. The batter seemed very nice and smooth, and when I baked them (each tray was done in 21 minutes), they seemed to have had a nice consistency. The recipe required the sugar syrup that the stem ginger came in to be mixed with water and then reduced, but this seemed unnecessary to me, so I just spooned over the gingery syrup straight from the jar. The Icing. This is where it all went wrong. The recipe called for ginger infused milk, to which I thought I should add a bit of vanilla extract. I think this curdled the milk. 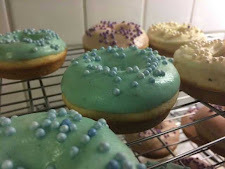 In the future, when wanting to add vanilla to icing that involves milk, I will make sure I use vanillinsocker or vaniljpulver as they do not have alcohol, and are dry ingredients, so should not curdle it. As upsetting as the icing was, I think the cakes were good - nice consistency, but I think I would prefer ginger flavour, rather than ginger pieces. Doubling the quantities yielded 28 cupcakes (my muffin tin is slightly smaller than standard).